Okay, before anyone gets overly anxious about this, Paramount's new take on Dune isn't actually dead, but the Peter Berg version is - and that's what this concept art is for. Earlier today, a bunch of concept art from two projects hit the web, but unfortunately it's some beautiful concept art for two projects that are now dead in the water. 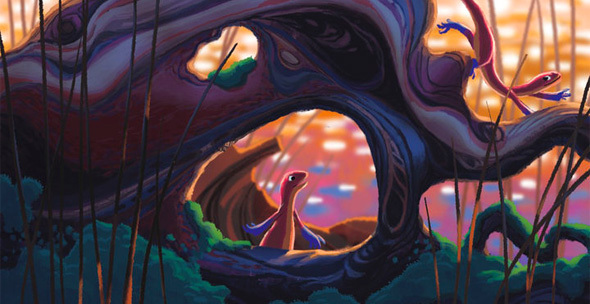 The first set of art is from Pixar's Newt, which we reported last May was canceled, supposedly because of Rango. Pixar's own Facebook page put up a huge gallery. 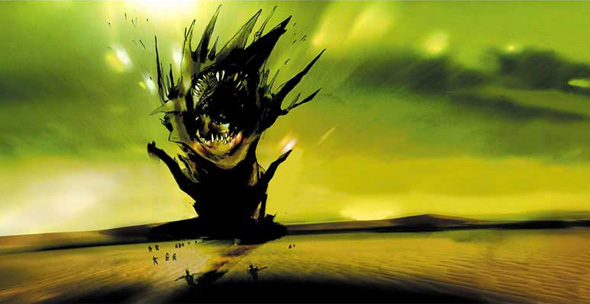 The second set is for Peter Berg's Dune adaptation, with art from Jock, who posted a big gallery on his own website. Examples from both are below. Click either concept art pieces below, one from each project, to be taken to movie sites with the full galleries. Both of these look amazing, I'm actually quite sad the projects are dead. Newt was going to be about a newt who finds out he's the only one of his kind left, but then finds a mate elsewhere, which also sounds similar to Blue Sky's Rio. Beautiful art for that. 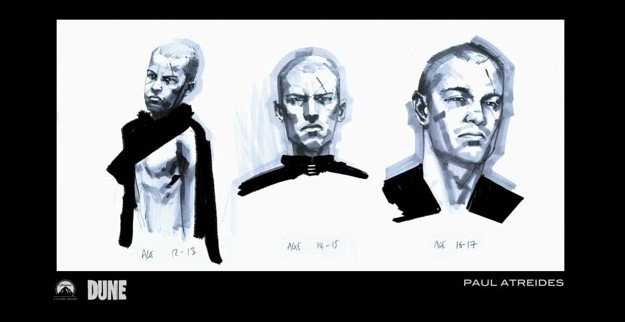 And as for Dune, I'm still excited to see Pierre Morel's take on the sci-fi epic, but I love all of Jock's art. Those spice worms look badass and it just looks like it would've been pretty awesome. Except I'm not sure if the characters would've been a little bit too stylized. It's interesting that we even get to see all this concept and, as I said before, unfortunate that both of these are no longer going to be made. But of course, Pixar has plenty more in the works, and a new Dune movie is still coming eventually. Looked fun. The first one. The second one was a little too childish. Alex - How could Pixar dump Newt "supposedly because of Rango," when you previously reported that Rango was ILM's first animated feature? Pixar didn't dump Bug's Life because of Antz. sad these two never made it. They dumped Newt in favor of pushing Cars 2 in theaters. Pixar and Disney also pulled out of the Annie Awards the animation awards, because they didn't like that Kung fu Panda beat Wall-E, Pixar is full of a bunch of assholes!